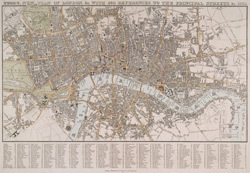 The title of this folding map of London appears along the top. The city boundaries, open spaces, roads and watercourses are depicted in colour in colour. This is a later edition of a map first issued by Tegg in 1823. It is divided into rectangles for reference, with a street index in panel below the plan.